I've never rooted for an Iowa team more in my life. I try to keep things even in the recaps, but I am thrilled for the Barnstormers and Des Moines on winning the United Bowl. If any team deserves this, it's Dixie Wooten's team! Drew Powell should have been United Bowl MVP in my opinion. You could go any which way. Powell was definitely deserved as well. 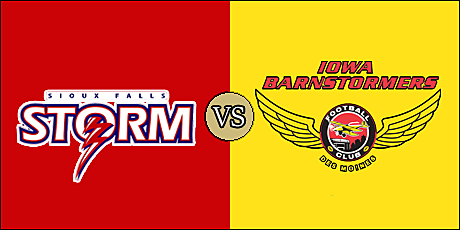 I didn't think the Barnstormers could do it, but they did. I'm happy for Des Moines they have waited a long time for a title and they finally get it. That was a fantastic game and I'm glad I got to share it with you ladies. NFL season is coming up, so the return of my "Random Thoughts & Stuff" column is coming. Good night everybody.